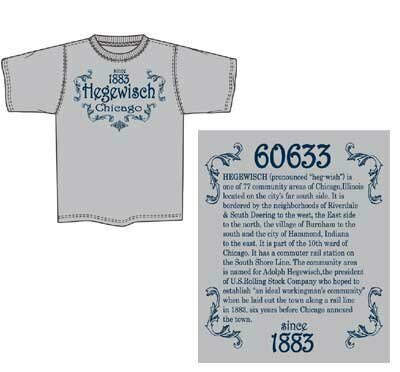 LukasGraphics, a company owned by former long time Hegewisch resident, Michael Lukas, is selling a Hegewisch themed T-Shirt. The shirts come in adult sizes S-XXL. Cost is $13.00. $5.00 of each sale go to support a children's charity. To order your own t-shirt fill out the attached order form and mail it to Michael Lukas. Hegewisch.Net is not associated with Michael Lukas. Hegewisch.Net has not and will not profit from the sell of these shirts and is not responsible for any transactions between Michael Lukas and persons purchasing products from Michael Lukas. HEGEWISCH (pronounced “heg-wish”) is one of 77 community areas in Chicago, Illinois located on the city’s far south side It is bordered by the neighborhoods of Riverdale & South Deering to the west, the East Side to the north, the village of Burnham to the south and the city of Hammond, Indiana to the east. It is part of the the 10th ward of Chicago. It has a commuter rail station the South Shore Line. The community area is named for Adolph Hegewisch, the president of the U.S. Rolling Stock Company who hoped to establish “an ideal workingman’s community” when he laid out the town along a rail line in 1883, six years before Chicago annexed the town.